The first question you need to be asking yourself is: “Who am I making this game for?” “Who will play my game?” Now let’s be clear, yes you’re going to love your game, but ultimately, you’re not going to be the one playing it. You’re the one making it. 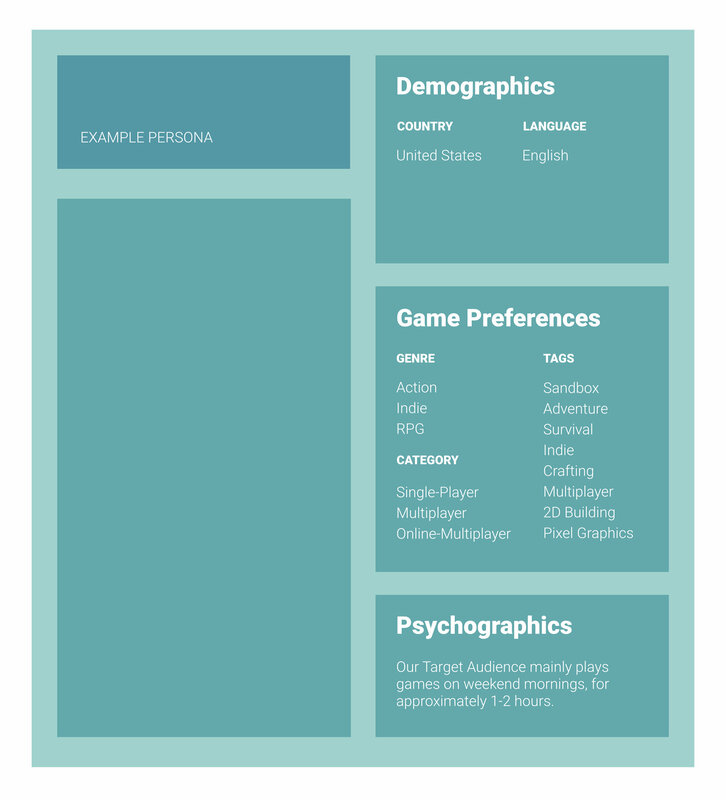 – Defining your audience enables you to make informed decisions during the game development process (should I do X or Y, how should I tweak this mechanic, etc.). Although this process will take some time upfront, it will save you a ton of time down the track. – When it comes to marketing/advertising your game you know who you are marketing towards, and where to find them. – If you are looking for external funding, you’d best believe you’re going to need to have all of this understood and documented! Alright, so we now understand the importance of defining your target audience; but how do you actually start doing that? The second question you need to ask yourself is: “What sort of game am I making?”. This includes (but is not limited to): mechanics, art style, genre, and release model (standalone, episodic, etc.). A really useful tool to start this is the “Indie Game Development Positioning Workbook” from Surprise Attack Games. A spaceship roguelike where you control a team of chickens and your spaceship is a giant chicken. 8 bit art. Turn based combat. Crafting. Flying. Wow, what a game! 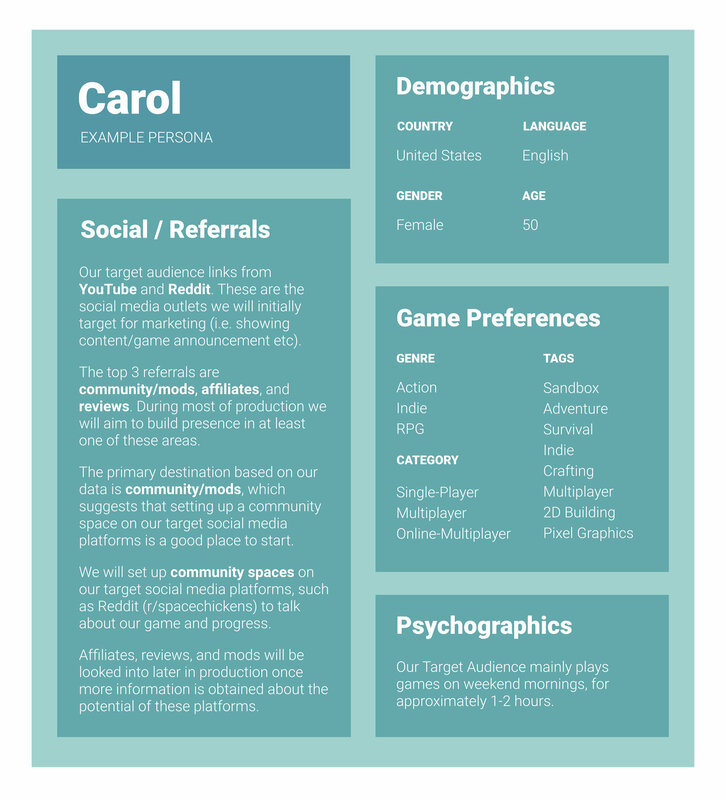 Developing a target audience persona enables you to know who would be interested in your game, what they like about games, where you can find them to tell them about your game, age, location, and any other relevant data. This data changes frequently so take lots of screenshots, and record the dates of the dataset. 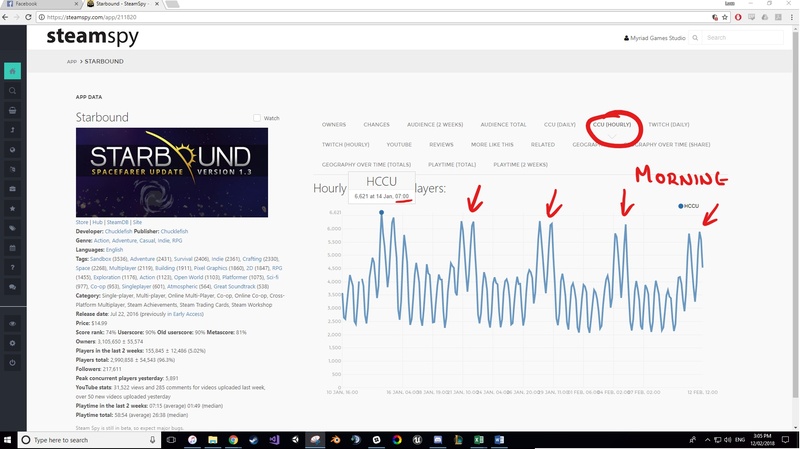 This allows you to know how relevant/out of date your data is. So here it is. Let’s get into it! First step is to pick out all the games that compare to your game (ok maybe not all, but at least 10-12). These games should be similar to the game you want to make; either by genre, art style, or any other metric that you think is appropriate for your game. A good way to do this is to trawl through Steam looking at specific genres, tags, categories etc. 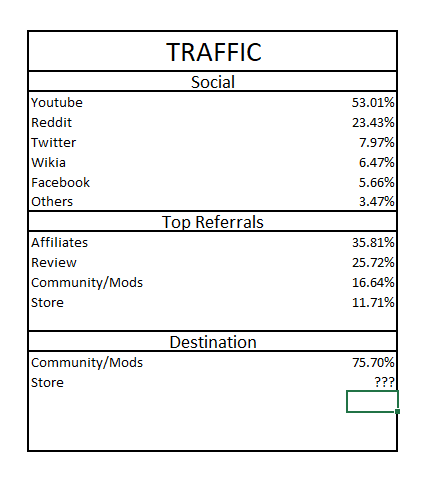 Justin Carroll wrote an awesome step by step article about the process of doing ‘lookalike’ target audience research – I leaned heavily on this when doing my own research, but chose to include data from SteamSpy rather than Facebook. Update: Since originally writing this article, SteamSpy has changed how they operate and you will need to support the developer through their Patreon to gain access to some of the data I make reference to. This article is more about documenting a process than telling you exactly how you should obtain this information, so it’s up to you whether or not you use SteamSpy. 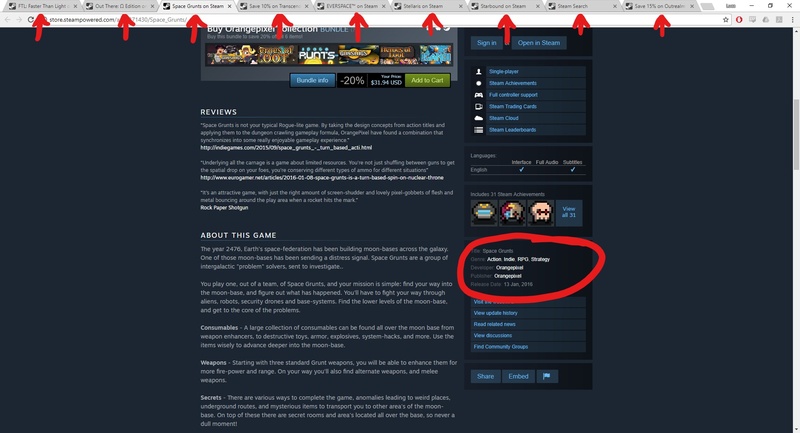 If you have never used or heard of SteamSpy before, it’s a great resource for viewing information about games on Steam. They have done all the data collection for you, and have even presented it in a (reasonably) straightforward manner. Create an account so you can get access to all of their data (don’t worry, it’s free and they don’t hassle your email). I prefer numbering like this rather than using the numbers specifically from SteamSpy, since it better normalises very popular/well known games (Terraria) against lesser known games (Space Grunts). Once I have done this for each game I put all the values side by side. I add them up and then divide by maximum value for each game. 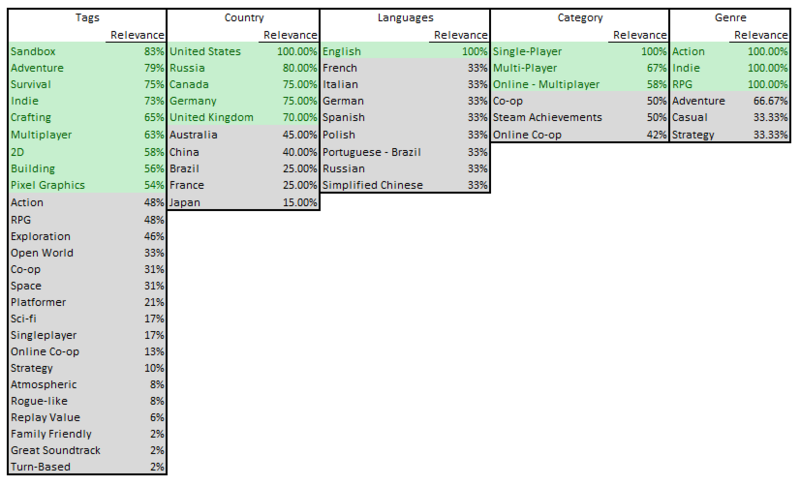 Now we just have to do this for each of the remaining data points: category, languages, genre, and country. Languages and genre are a little more binary than the other data sets, so I don’t bother numbering and just look at whether or not it was included. I have highlighted anything down to 50% green. These are our most relevant attributes that are worth considering. Anything less than 50% I chose to ignore. 50% was just pulled out of thin air, you can use any % that you think is better representative, or includes/excludes more attributes. For example, perhaps all of the games you’re comparing to are so similar that every tag is 50% or more relevant. You might want to only consider the top 80%. It’s up to you, just document your reasoning. From these tables you can infer what it is about these games that their target audiences are looking for/enjoying; and therefore what they’ll like about your game. 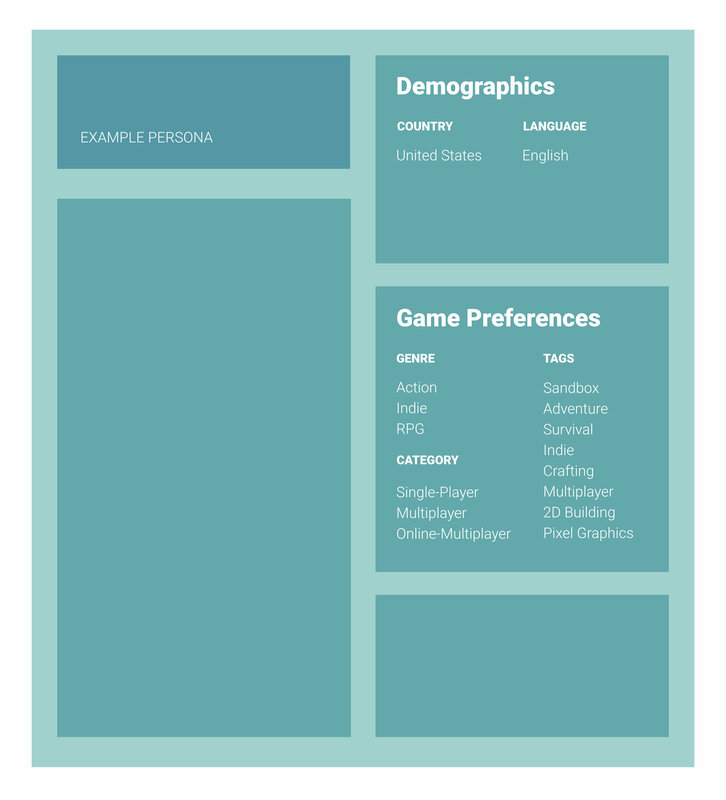 There is a really good article on personas by Emmy Jonassen that talks about why you need them for your indie game; it is very much worth a read (in fact all of her articles on marketing are worth reading!). Ok so how about game length? How long will your game be? How do you start to answer this question? 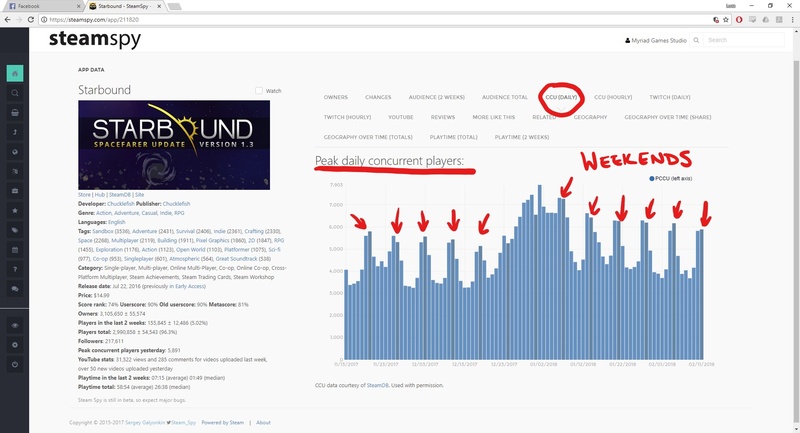 Well, SteamSpy will also give us access to concurrent players on an hourly and daily scale. From this we can start to figure out the psychographics of our target audience. Now I’m not going to tell you you should scrawl through these graphs and record all of data points… But I’m going to heavily imply that you should. At face value, these graphs are great for anecdotal evidence about playtime; but actually having that data recorded and being able to manipulate it is going to be considerably more useful. Our target audience mainly plays games on weekend mornings, for approximately 1-2 hours. Boom! Let’s add it to our persona! Ok, now we want to check out SimilarWeb. 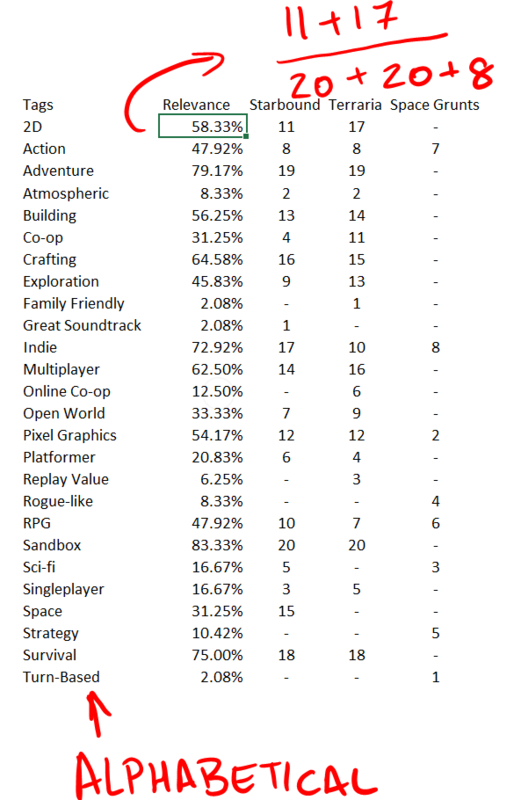 SimilarWeb is similar (heh) to SteamSpy in that they have done all the data collection for you, and have presented it in a (reasonably) straightforward manner; except instead of looking for game specific data (genres, tags, etc.) 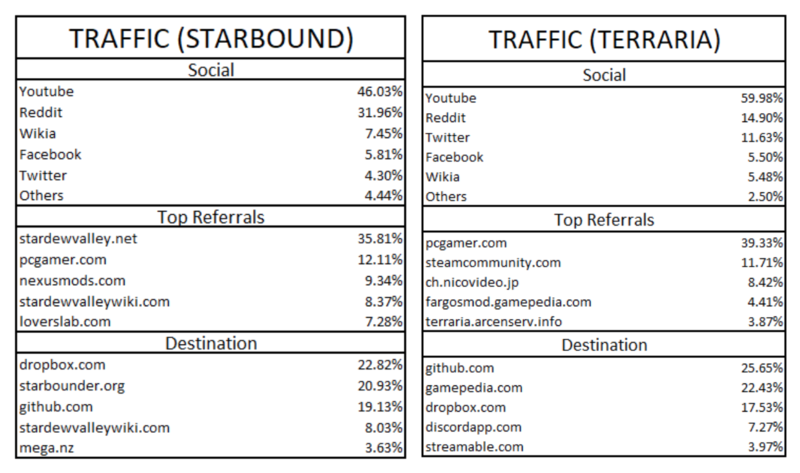 we’re going to look at traffic data surrounding each of our comparison game websites. They have a free account you can sign up for, which is all we’ll need at this stage. SimilarWeb has two faces. The first is the one on their landing page – you can pop in a web address and it will produce a report which you can then have emailed to you. The second is called their ‘SimilarWeb Platform’ – which they also call their ‘pro’ side. Creating a free account will still grant you access to the ‘pro’ side, you just won’t have access to absolutely all of the data that SimilarWeb offers. That’s all totally fine though, since we’re only interested in the data they offer for free. Once your account is created make sure you’re on the ‘pro’ side of the site (pro.similarweb.com). SimilarWeb will spit out a date-stamped report; I highly recommend saving these reports (you should see a ‘download’ option, or ‘email me report’ depending on which part of the site you’re on) – or at the very least taking numerous screenshots and dating them. There will be a lot of data from SimilarWeb. A LOT of data. Sometimes it can be hard to see the forest for the trees. I’m only just working through it all now myself; but what we’re after right now are referrals, destinations, and social outlets. You should also record the age and gender info from the site (pro side only), since it doesn’t get published with the report (or at least it hasn’t with any report I have gotten so far). We’ll use that data later. A limitation of SimilarWeb is that you can only look at the data to and from the home page of a website, so if your game has a URL like this: https://www.orangepixel.net/spacegrunts SimilarWeb will default to data to and from https://www.orangepixel.net/. Even though this is the main website for the developer, there is a good chance they’re going to have many other games and so any data about one game specifically is going to be lost amongst the forest. But what do all of these percentages and words mean!?! 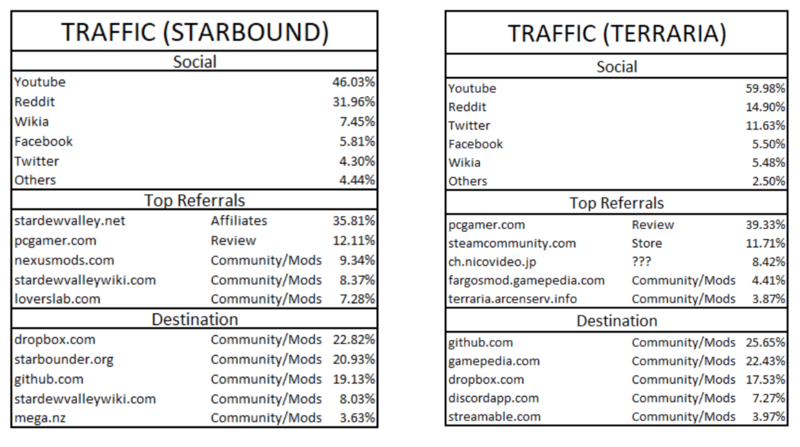 The top image is showing us which social platforms are linked the most to the website we’re looking at. The Referring Websites and Links Destination images are showing us the traffic pathways to and from this website. Let’s record this data in tables! Do the same for our other game websites; note that I have chosen to neglect the ‘Space Grunts’ data since their landing page is very far removed from their game specific page. We need to make these destination and referral links more usable, so let’s have a look at why they were linked to/from and assign them a new tag (this is going to require going to all of these links and assessing the reason for linking). Okay, so the studio that made Starbound is Chucklefish, and they were the publishers for Stardew Valley. 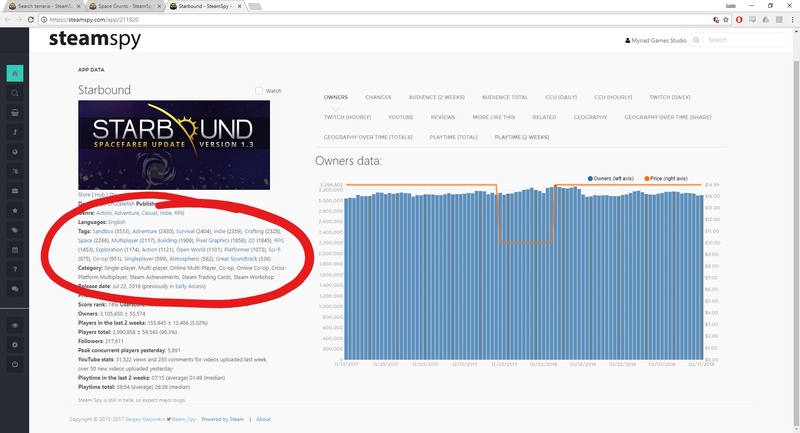 So we can see that people linked to Starbound from Stardew Valley due to studio/publisher ties. Let’s tag this referral as “Affiliates”. It’s reasonable to assume any links to and from sites like PC Gamer are going to be because of reviews. So let’s tag that ‘Review’. Let’s lump all links to and from websites like Wikia, Nexusmods, etc., under “Community/Mods”. This is where you’ll find interesting links about your chosen games that you hadn’t thought of. For example, going into this I had no idea so many people modded games like Starbound and Terraria! If a particular link talks about aspects of the game, but isn’t reaaaally a review, I would tag it as an “Article”. Some examples are for Firewatch – there are a number of websites that have written about Firewatch’s website parallax effect from an aesthetic point of view. Alright! Now let’s add all this data to our persona. There’s heaps of information here. You can make informed design decisions and start planning how to target social media and marketing. However, there is some additional data we can get – gender and age. 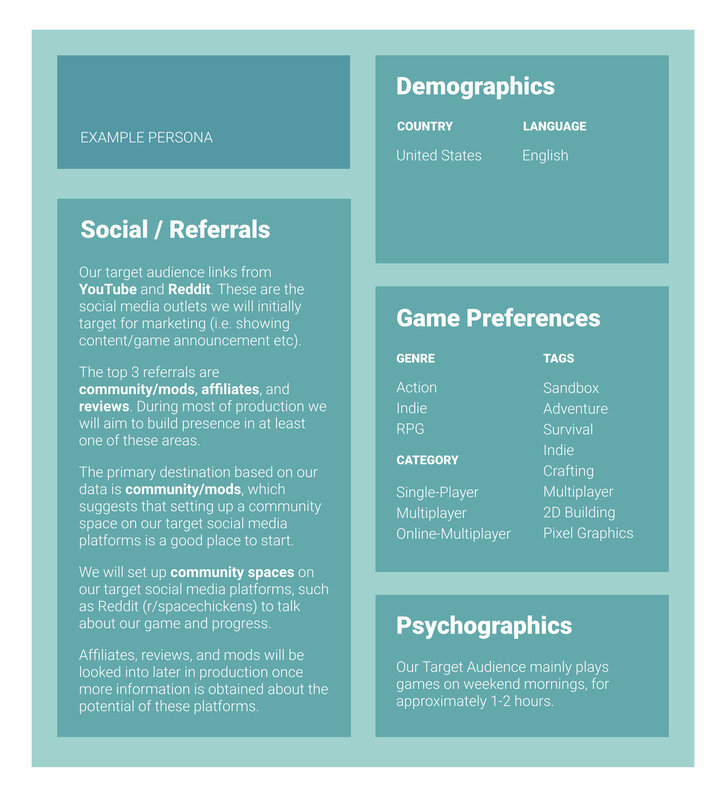 As I mentioned earlier, the ‘demographics’ info from SimilarWeb does not get published in their report; but the ‘pro’ site has a tab for demographic where you can find this information – and Justin’s article How to Research Your next Game’s Target Audience for Free shows you how to get this demographic data from Facebook and AdWords. The reason I wanted to leave this section until the end is because even though it’s useful to get a sense of the gender and age of your audience, you might choose to ignore it for various reasons. In fact, there’s plenty of data here that you might choose to ignore. Or redefine. Or do anything else with because ultimately all of this data – your target audience – is a tool to inform your decision making process. As long as you state your intentions and explain why you’re choosing to interpret your data in a particular way, you’re golden. You might find the majority of people in your target audience are men in their early 20’s (no big surprise); but that doesn’t mean you have to make your game for them. 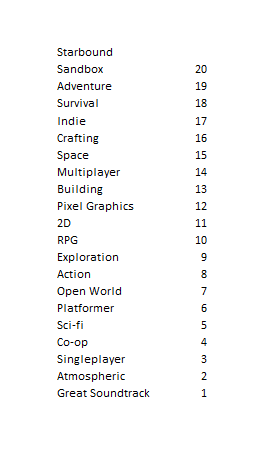 And so, even though my data is telling me that the target audience for my sandbox, adventure, survival, indie, crafting game is 85.36% male with an age distribution of 42.02% between 18-24 – ‘CHICKENS IN SPAAAAAACE’ is going to be made for women aged 45-54. It’s clear from the data above that this portion of our demographic is quite small, but this theoretical game isn’t being made to make large profits. This is the demographic that represents my mother and I want to make a game that my mother will play and enjoy – she likes chickens! Does your target audience spend their time on Twitter? Then make sure you are talking / sharing content about your game on Twitter! Does no one play your type of game for longer than 2 hours at a time, or for 5 hours total? Then don’t make more than that amount of content, and make sure those habits fit with the gameplay! You can now point at your persona and say “I made this decision because of what it says right here”. All this data and research can be overwhelming, but it’s also incredibly valuable. If the captain of a ship told you he was going to sail off with no bearing or destination in mind you wouldn’t have much hope of him actually getting anywhere – and it’s no different for a game. Marketing is often addressed far later than it should be, and I think a big reason for that is just not knowing where to start. Some future steps would be to figure how big this audience is and thinking about targeting/pricing your game accordingly. All of this while still actually making the dang thing!